Rabbit is dying of breast cancer and this is her life story. 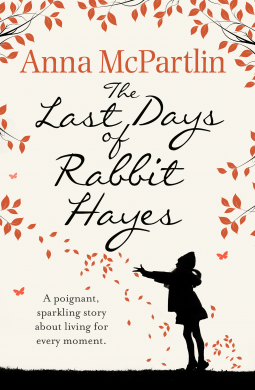 Anna McPartlin has written the story of Rabbit’s last few days, in a hospice, surrounded by family and friends. And it is the story of her life. It will make you laugh and cry, tossing your emotions around like a washing machine on spin cycle. I loved it. It’s an interesting story to read, from an author’s point of view, as we know what happens. The title tells us that this is the story of Rabbit’s last days, therefore she is going to die at the end. But this doesn’t matter a jot, as we see her life in flashbacks. I liked the character so much I wanted to read about her. It is at times irreverent, it will make you laugh out loud – especially at the scene which involves Rabbit sleeping, her mother, and a priest – and it will bring a tear to the eye as the future of Rabbit’s daughter hangs in the balance. Will she stay in Ireland, or go abroad? To find out more about Anna McPartlin, click here for her website. Read my review of Somewhere Inside of Happy, also by Anna McPartlin.